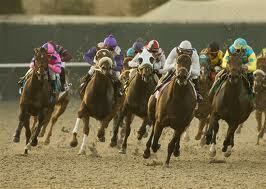 ~ Thoroughbred Racing ~ The Sport Of Kings ! Thoroughbred horse racing is a worldwide sport and industry involving the racing of Thoroughbred horses. It is governed by different national bodies. There are two forms of the sport: Flat racing and National Hunt racing. National Hunt racing can be further divided into hurdling and steeplechasing. A horse runs in the unique colors of its owner. These colors must be registered under the national governing bodies and no two owners may have the same colors. The rights to certain color arrangements ("cherished colors") are valuable in the same way that distinctive car registration numbers are of value. It is said that Mrs Sue Magnier (owner of George Washington, Galileo etc.) paid £50,000 for her distinctive dark blue colors. If an owner has more than one horse running in the same race then some slight variant in colors is often used (normally a different coloured cap) or the race club colors may be used. The horse owner typically pays a monthly retainer or, in North America, a "day rate" to his or her trainer, together with fees for use of the training center or gallops (if the horse is not stabled at a race track), veterinarian and farrier fees and other expenses such as mortality insurance premiums, stakes entry fees and jockeys' fees. The typical cost of owning a race horse in training for one year is in the order of £15,000 in the United Kingdom and as much as $35,000 at major race tracks in North America. A handicap race is one in which the runners have been "handicapped" by carrying more weight, also called an impost, according to their performance in other races. Theoretically, all horses have a chance of being competitive in a race that is correctly handicapped. Examples include the Grand National, the Cambridgeshire Handicap, the Donn Handicap, the Santa Anita Handicap, the Hollywood Gold Cup, the Auckland Cup, the Easter Handicap, the Caulfield Cup, and the Melbourne Cup. Higher-class races for bigger prizes are known by different terms in various countries—graded stakes races in the United States and Canada, conditions races in England and France, and group races in Australia and New Zealand. They often involve competitors that belong to the same gender, age and class. These races may, though, be "weight-for-age", with weights adjusted only according to age, and also there are "set weights" where all horses carry the same weight. Furthermore, there are "conditions" races, in which horses carry weights that are set by conditions, such as having won a certain number of races, or races of a certain value. Examples of a stakes/conditions race are the Breeders' Cup races,the Dubai World Cup, the 2,000 Guineas Stakes, the 1,000 Guineas Stakes, the Epsom Derby, the Epsom Oaks, the St. Leger Stakes, the Kentucky Derby, the Kentucky Oaks, the Preakness Stakes, the Belmont Stakes, the Travers Stakes, and the Prix de l'Arc de Triomphe. A maiden race is one in which the runners have never won a race. Maiden races can be among horses of many different age groups. It is similar to a stakes race in the respect that horses all carry similar weights and there are no handicapped "penalties." This is the primary method for racing a 2 year old for the first time, although only against other 2 year olds. Three year olds also only race against their own age in maiden races early in the year.